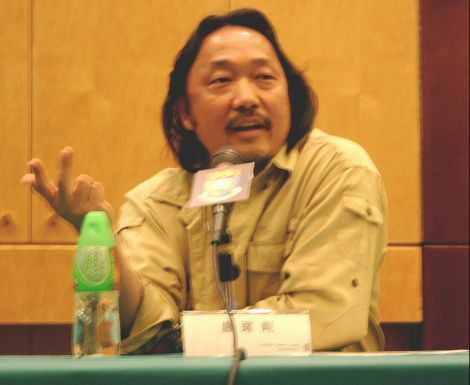 According to a January 2011 report on Rednet.cn, two groups of students from Number Five Secondary School in Changde’s Taoyuan County (桃源县) were forced to wait in the snow for an hour to welcome a visiting government leader, and then had to sit on ice-cold chairs outside the school as the leader delivered a speech. Local weather information indicated that the temperature in Taoyuan that day hovered between 1 and 3 degrees Celsius. 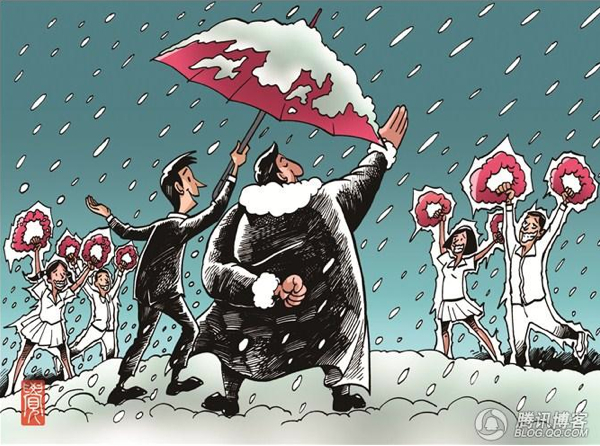 In this cartoon, posted by the Kunming-based studio Yuan Jiao Man’s Space (圆觉漫时空) to QQ.com, a government leader dressed in a padded winter coat speaks grandiloquently, his hand slicing through the air, as a fawning assistant holds and umbrella to protect him from the snow. Meanwhile, students bearing red wreaths of welcome stand frozen in obsequious poses..